Who doesn’t love homemade pickles? But sometimes the idea of making them seems daunting. Quick pickle recipes to the rescue – easy to make and store refrigerated! This method is perfect for home pickling beginners. My recipe for Quick Summer Garden Pickles is fast and easy. Clean quart jars, then pack with a mixture of vegetables (think baby cukes, carrots, peppers, and cauliflower), garlic, chili pods and some fresh flowering dill too if you have it. Boil up a sweet and tart brine and quickly pour into the veggie-packed jars. Quickly screw on the lid, and cool to room temperature for about 45 minutes, then pop into the refrigerator! In just two days, you’ll have delicious pickles to bring to a picnic or enjoy at a backyard BBQ. And pickling isn’t just for veggies. 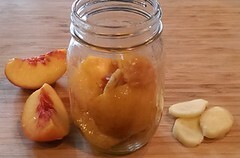 For something a little different, try one of my favorites, Blushing Pickled Peaches! Peaches, fresh ginger, and garlic are covered with a brine of red wine, white vinegar, sugar, salt, coriander seeds and crushed red pepper. They will keep for a month in the refrigerator. Perfectly d’lish to serve up with your favorite cheeses or grilled meats! Who’s ready for tangy Blushing Pickled Peaches? Be sure to use a freestone variety of peach for this recipe such as Elberta or Hale. Great with grilled ham, steaks and poultry, and especially fantastic with thinly sliced prosciutto, crusty French bread and a glass of Northwest Pinot Gris. 5 – 6 large ripe peaches, peeled, pitted and quartered, about 2 – 2 1/4 lbs. 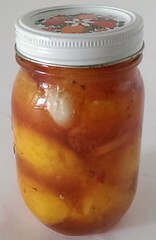 Tightly pack the peach halves, alternating with the ginger and garlic, into 2 clean 1/2-quart jars. (or you can do one 1-quart jar). Meanwhile, in a small, non-reactive saucepan bring the remaining ingredients to a quick boil over high heat. Immediately remove from heat and ladle over the peaches, making sure to cover them and transferring all the spices to the peaches. Cover tightly and let cool to room temperature. Immediately after cooling, refrigerate peaches. 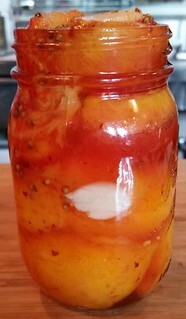 Chill the pickled peaches for 2 – 3 days before using them. They’ll keep 4 weeks in the refrigerator. Place all vegetables in a large bowl and toss together to mix colors. Divide vegetables among four clean, regular mouth 1-quart canning jars, packing vegetables in tight. Set jars on a dish towel in a draft-free place in the kitchen. Place the pickling brine ingredients in a non-aluminum sauce pan over high heat. Bring to a rolling boil and then immediately ladle pickling brine into filled jars, filling to 1/2″ from the top and being sure to cover the vegetables and distribute spices evenly. Immediately cover jar with lid and tighten. Let cool to room temperature, then refrigerate. Let pickle for at least 2 days before eating. Pickles will last refrigerated up to 1 month. Seattle’s KUOW – 94.9 FM is airing segments on farmers markets. Check out this segment on the Ballard Farmers Market and my tips on how to pick fresh peaches, including my Honey Lavender Peach Fizz recipe! 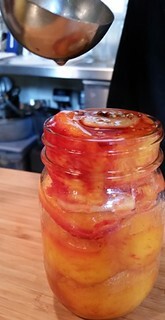 And for a demo on how to make Fresh Peach Puree, check out www.LiquidKitchen.tv. 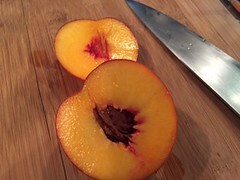 It’s that time of summer when juicy stone fruits come to market: nectarines, plums, apricots and my favorite, PEACHES! But isn’t it a bummer when you get a peach and it’s not bursting with that sweet flavor you remember? Well, peach evangelist Jon Rowley has worked to fix that. that will mean that its gonna be sweet! Every year he collaborates with Pence Orchards in Wapato and the organic Frog Hollow Farms in Brentwood, California for Peach-O-Rama, celebrated at Met Markets. Each of these peaches must meet a minimum of 13 Brix (that is the measure of the % of sugar in the peach). So what to do with all these juicy peaches? Well, eating peaches out of hand is amazingly delicious, but I also love them sliced and tossed in an arugula salad dotted with goat cheese and a sprinkle of toasted northwest hazelnuts. And if you love sweetness, there is nothing better than a delicious homemade peach pie. And one of my favorites is with stone fruits: peaches, cherries and apricots. But you can make it with all peaches, too! 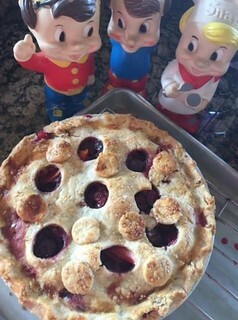 The recipe incorporates my favorite fruit pie tip: put down a thin rolled out layer of almond paste on the bottom crust before filling the pie it adds a delicious flavor and keeps the crust from getting soggy. Peaches combine with other Stone Fruits in this delicious pie! 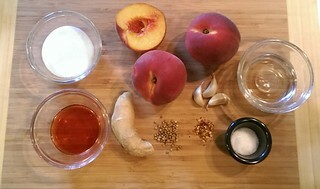 You can use all peaches in the pie if you like or a variety of other stone fruits to mix in with the peaches. 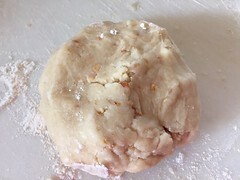 To make the crust: In a large bowl, combine flour, salt and nutmeg. Cut in shortening and butter until particles are pea-sized. Sprinkle in ice water, 1 tablespoon at a time, mixing gently with a fork until dough comes together in a ball. On a lightly floured surface, roll out the first piece of dough to a bit bigger than your 9-inch pie pan. Brush excess flour off crust, and then gently roll up crust onto rolling pin. Unroll into pie pan and press/fit crust into pan. Roll crust over at edges. Roll out the remaining piece of dough to fit top of pan, but slightly bigger. 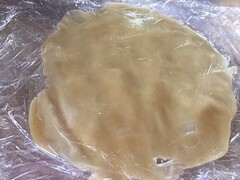 Cover with plastic and move on to making the filling. To fill the pie: Roll marzipan into a ball, then press out into a disk on a piece of plastic wrap. Cover with another piece of plastic wrap. Roll out to fit the bottom crust, place it in the freezer if it’s too soft. 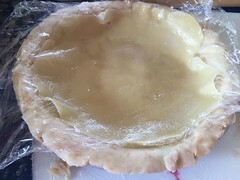 Remove the top piece of plastic wrap, then turn it into the curst using plastic wrap as a guide, fit marzipan into the bottom crust. (Remove the plastic wrap). Place the peaches, cherries and apricots in a large bowl. In a small bowl, mix together sugars and flour, and then sprinkle over the fruit. Toss to coat the fruit well. Place fruit filling into lined pie pan. 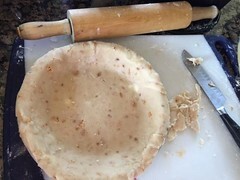 Place remaining dough round on top of pie, trimming off any excess dough. Then crimp bottom and top crusts together with your fingers to seal well and make a pretty edge. Mix together egg and milk, and lightly brush on top with a pastry brush. Sprinkle with sanding sugar. Make several slits in the top (or cut fun shapes) to allow steam to escape. Bake in preheated oven for about 1 hour or until crust is golden and filling is cooked through and bubbling. Cool pie on a rack. To make Almond Cream: When ready to serve, whip the cream until it begins to thicken. Add remaining ingredients and whip until stiff. Serve dolloped on pieces of pie.